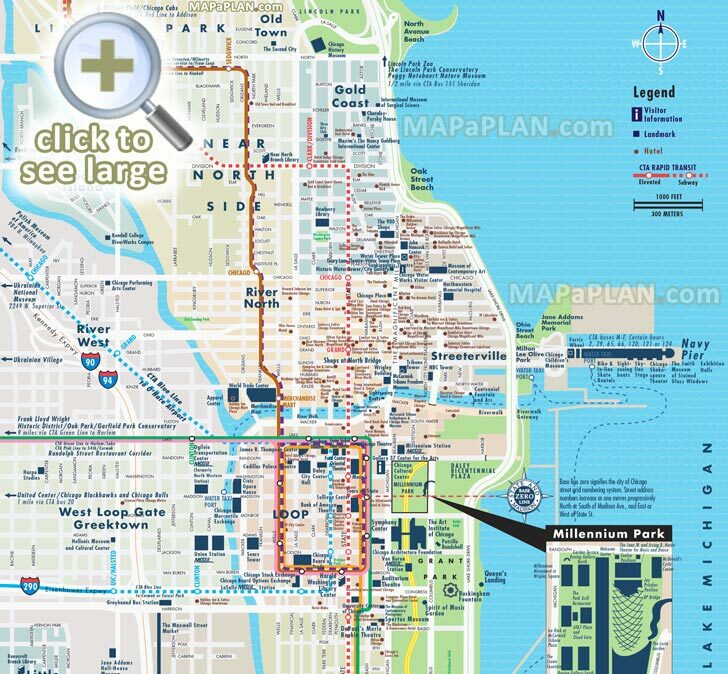 Chicago maps will guide you to the best destinations in this cosmopolitan city. Chicago's got something for everyone, whether your tastes run toward world-famous museums or neighborhood restaurants. 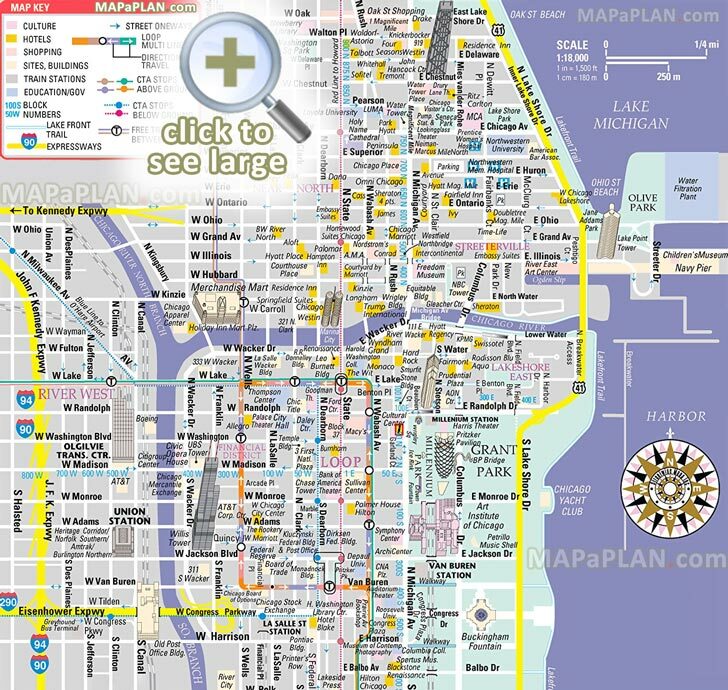 The configuration of Chicago’s streets and the excellent rapid mass transit system make the city easy to navigate. The Chicago River divides the city into three geographic zones: North Side, South Side, and West Side (Lake Michigan is where the East Side would be). 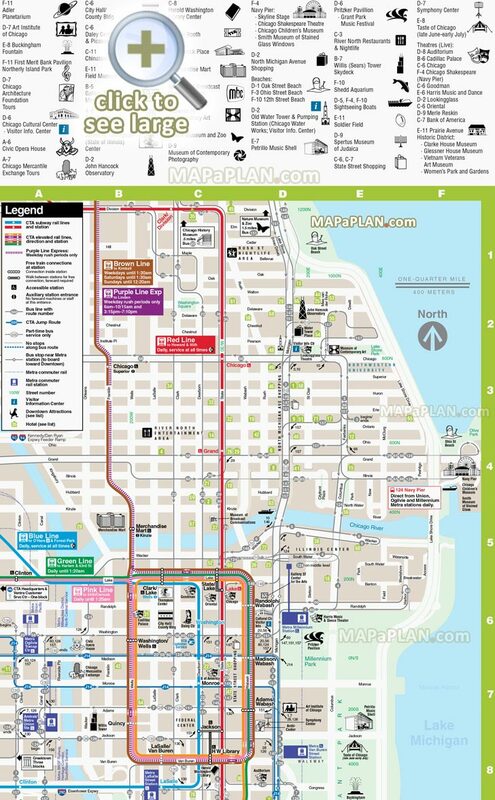 The downtown financial district is called the Loop. The city’s key shopping street is North Michigan Avenue, aka Magnificent Mile. Planning your itinerary may seem daunting, but never fear: Here's a set of maps with the very best places to visit. 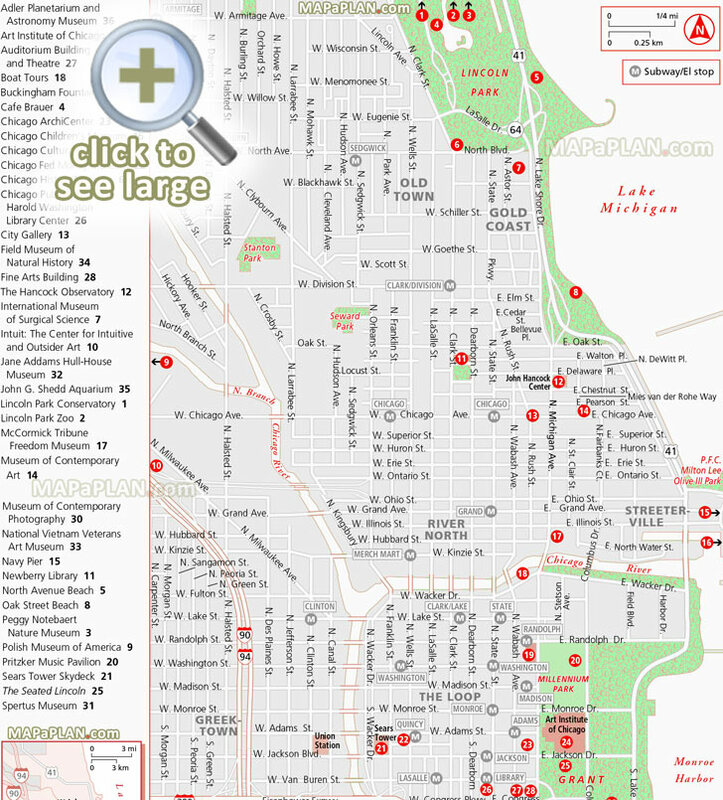 You can find the detailed locations of the must-see sights including Millennium Park, Bean Sculpture, Navy Pier, Art Intitute, Sears Tower Skydeck, Art Institute Gallery, Field Museum of Natural History, Wrigley Building, Frank Lloyd Wright’s Oak Park, Contemporary Art Museum, University, Second City, Americal Girl, Soldier Field, Buckingham Fountain, Grant Park, Lincoln Park Zoo, Shedd Aquarium, Water Tower, Union Station, State Street, Thompson Center, Trump Tower, Children's Museum, Chinatown, Federal Reserve, Amtrak Station, Hyde Park, Little Italy, Lincoln Park, beaches - just click on a selected map to access a high resolution version that can be downloaded and printed; or saved onto your mobile device. Marvel at the impressionist paintings in the Art Institute of Chicago - You can not only see the works by Monet, Matisse, Seurat, Renoir but also Picasso, Dali, Pollock, or Warhol. See your reflection in the reflective bean outdoor sculpture at Millennium Park - One of the most popular attractions is the huge elliptical Cloud Gate sculpture by British artist Anish Kapoor in which you can examine your reflection in funhouse-like distortions. While you’re here, don’t miss the stunning Frank Gehry–designed Pritzker Music Pavilion, home to free summer concerts performed by the Grant Park Symphony Orchestra. Stroll along the Navy Pier - Chicago’s number-one tourist attraction, this 3,000-foot-long (900m) pier was built during World War I and has served as a ballroom, a training center for navy pilots during World War II, and a satellite campus of the University of Illinois. 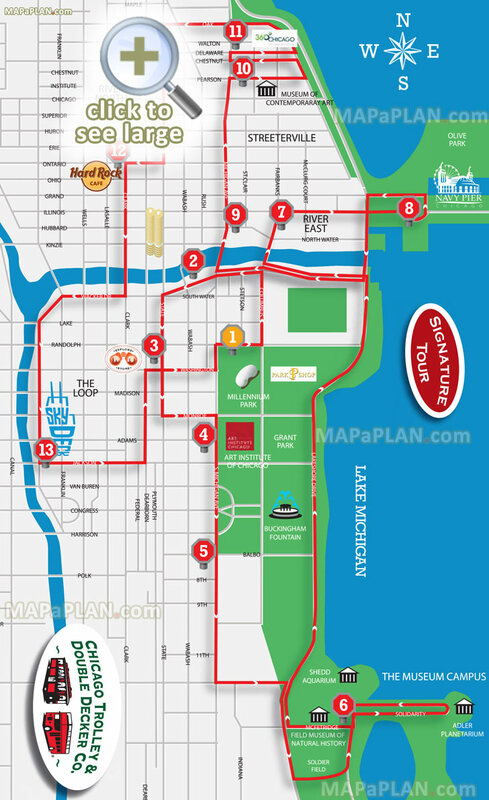 It’s hugely popular with families, as it combines a carnival, food court, and boat dock. The pier is a fun place to stroll (if you don’t mind crowds), though the commercialism of the place might be too much for some. Take a ride on our famous “El” train - The elevated train is not only the least expensive ride in town, it’s an experience that can be had only in Chicago. 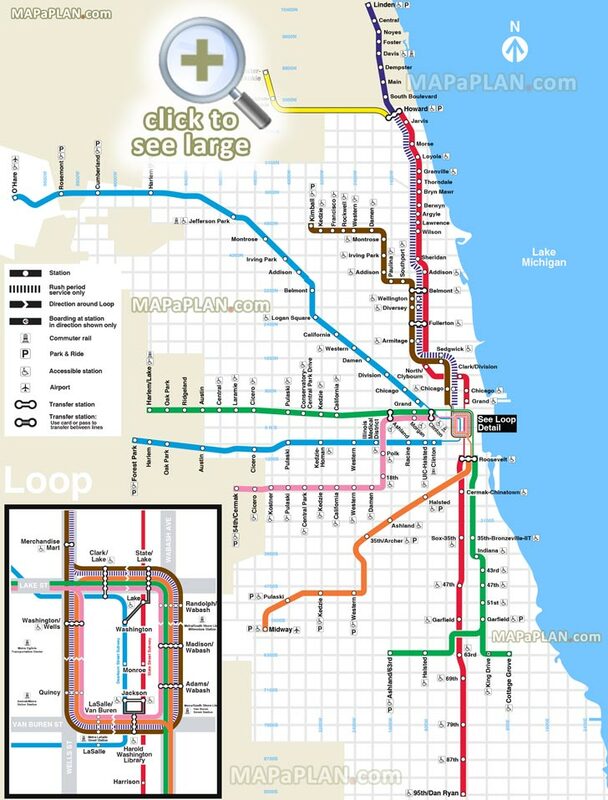 For the best views, board the Brown Line at Washington/Wells, and ride it around the Loop through the canyons of office buildings (you’ll be close enough to peer into some of them). Check out the view from the Skydeck open-air viewing deck at the Sears Tower (official name Willis Tower) or the Skywalk open-air walkway at the John Hancock Observatory. Admire the renowned skyline on a boat cruise along the Chicago River and Lake Michigan - The best way to get a perspective on Chicago’s history and learn about the dramatic buildings that form the city’s skyline is to take an architecture boat tour. Shopping is the thing on Michigan Avenue, and you can easily while away a day browsing and buying your way up the avenue. Other areas of the city offer chic boutiques and hard-to-find antiques and vintage clothing, but for a huge selection offering something for everyone, the Magnificent Mile with its shopping malls centers is your best bet. See a Chicago theater company performance - See great shows in Chicago, where curtains go up nightly on drama, comedy, and musicals in 200-plus venues of all sizes. Catch riveting works at Goodman Theatre, Steppenwolf Theatre Company, Lookingglass Theatre Company, Goodman Theatre, or Victory Gardens Theatre that prove Chicago is a driving force in American theater. Climb aboard a captured U-boat at the Museum of Science and Industry - It’s easy to spend a day here, especially if you take in an Omnimax movie, located in the Henry Crown Space Center, where you can also hop aboard a simulator to experience a space shuttle flight. Cheer for the local sports teams - In the evening, if the Cubs are in town, take the El uptown and catch a night baseball game at Wrigley Field. You can also enjoy explosive Blackhawks hockey or Bulls basketball action at the United Center, which size-wise is one of the country’s biggest arenas. Alternatively catch the Fire lighting up the soccer field at suburban Toyota Park. 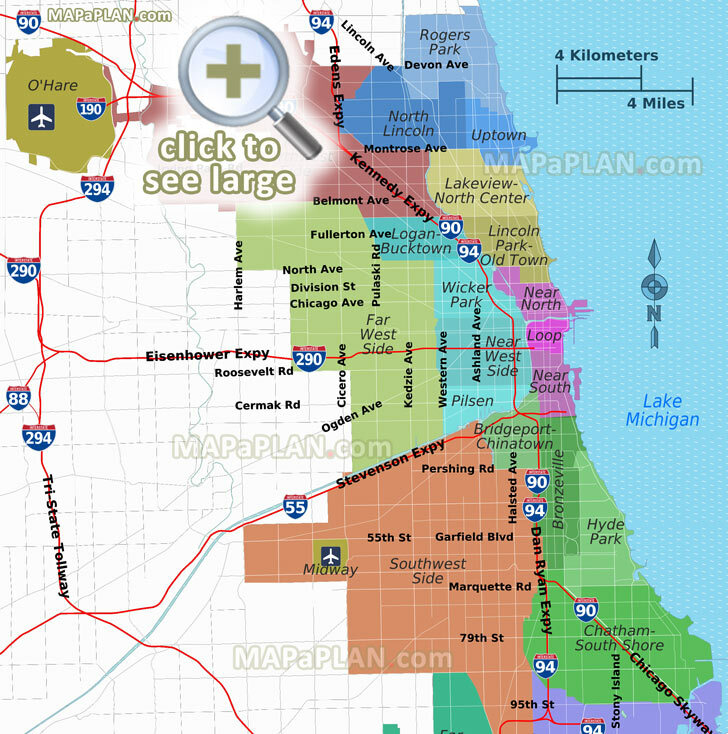 What are some interesting facts about Chicago? The "Historic Route 66" began in Chicago at Grant Park on Adams Street in front of the Art Institute of Chicago. Lincoln Park Zoo, one of only three major free zoos in the country, is one of the country's oldest zoos with an estimated annual attendance of 3.5 million. Chicago River is the only river in the world that flows backward. Engineers reversed the Chicago River in 1900 for sanitary purposes. 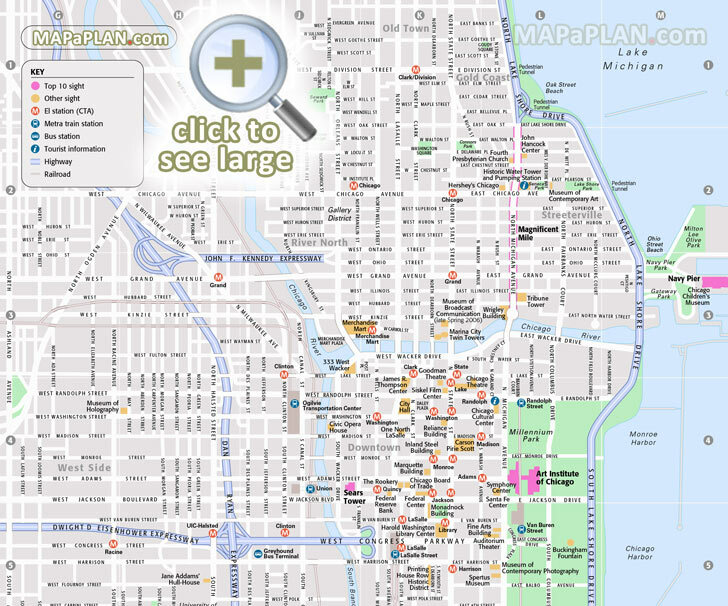 Chicago’s Western Avenue is the world’s longest continuous street, at 23.5 miles. 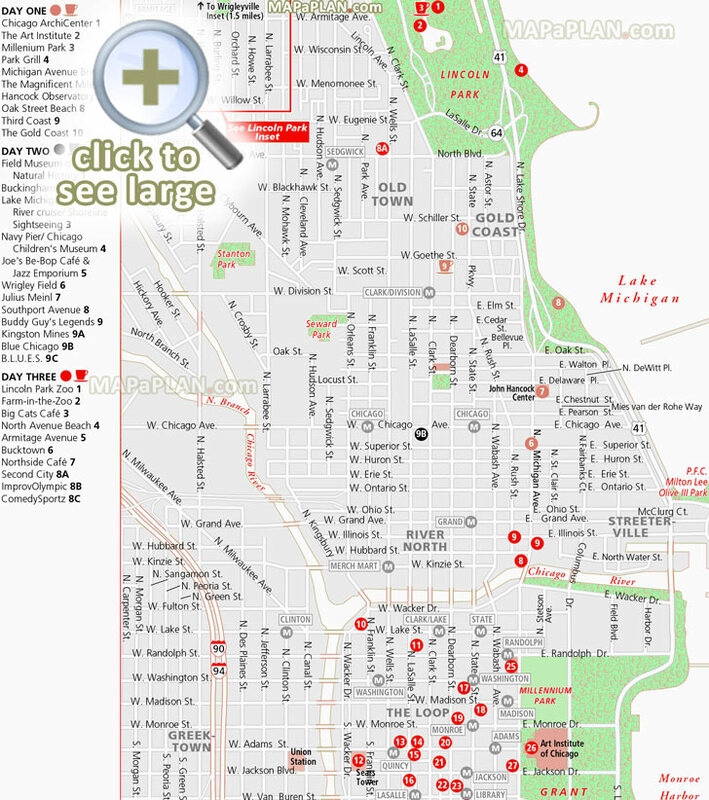 Chicago's downtown area is known as "The Loop." The nickname refers to the area encircled by the elevated (‘L') train tracks. The Willis Tower (formerly the Sears Tower) is one of the tallest buildings in the Western Hemisphere at 110 stories high. The Chicago Cultural Center is the first free municipal cultural center in the U.S. and home to the world's largest stained glass Tiffany dome. McCormick Place, Chicago's premier convention center, offers the largest amount of exhibition space in North America (2.6 million square feet). Shedd Aquarium is home to the oldest aquatic animal in a public aquarium in the world, an Australian lungfish named Granddad. Chicago has 15 miles of bathing beaches.